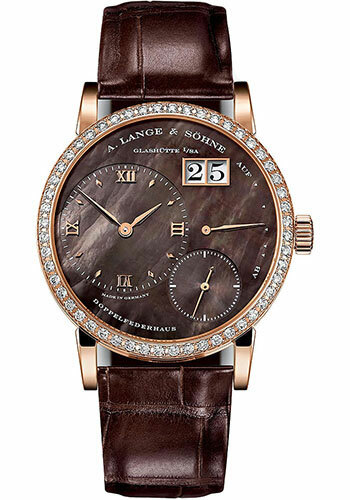 36.1mm 18K rose gold case, 10mm thick, transparent back, 18K rose gold bezel set with 52 brilliant cut diamonds weighing a total of approximately +/- 0.8K, scratch resistant sapphire crystal, mother of pearl dial with polished rose gold hands, calibre l901.4 manual winding movement, approximately 72 hours of power reserve, brown alligator/crocodile leather strap, tang buckle. Water resistant to 30 m (100ft). 36.1mm 18K rose gold case, 10mm thick, transparent back, 18K rose gold bezel, scratch resistant sapphire crystal, mother of pearl dial, caliber l901.4 manual-winding movement, approximately 72 hours of power reserve, white alligator/crocodile leather strap, tang buckle. Water resistant to 30 m (100ft).